All raw materials and components used in our Reactors and Transformers (eg. Copper, Aluminium, CRGO Silicon steel, transformer oil, insulation, bushings etc.) 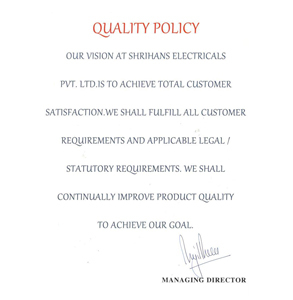 are purchased from reputed and approved suppliers and are also subjected to inward material inspection checks before acceptance of material. To ensure the designed performance, quality and reliability, strict process inspection is carried out at all stages of manufacture.